It’s time to change the way you approach fishing, as winter sets in on the coast. The water is getting colder, clearer, the bait is changing, weather is changing every 3 to 4 days, and fish are eating less. As a Professional Guide this is my favorite time of year to fish. In this article I will talk about lures for trout, redfish, and fly fishing for bull redfish. Trout fishing lures will fall into two categories this time of the year for me. The first category we will call search lures. 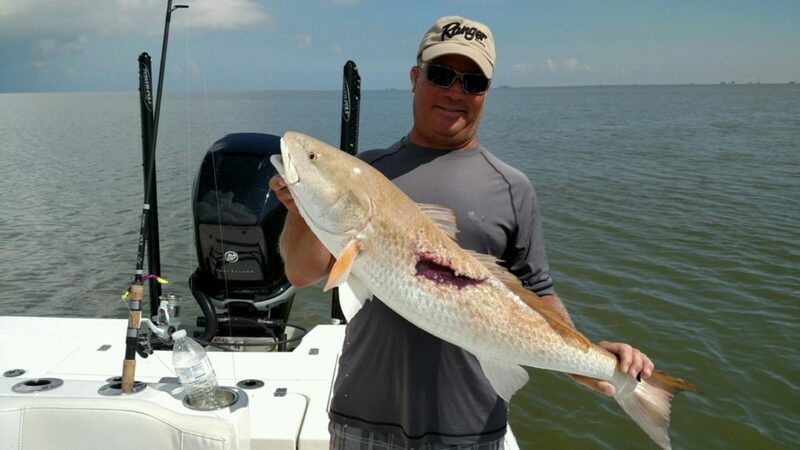 You are looking for a school of fish on a mudflat or oyster bar area and just looking for a reaction bite to let you know they are there. This type of fishing requires lots of fan casting, boat positioning, paying attention to where the bait is located, what direction the bait is moving, and water movement. My favorite lures for searching are a super spook, a small whopper plopper, a jerkbait that dives down 2 to 4 feet, a yum money minnow in 5 inch model, a chatterbait, and a fast sinking bait like a maniac mullet. I use mainly three colors this time of the year that include a natural color (bone or white/grey), a bright color (pink/flashy silver or chartreuse), and finally something that gives off shadows like a purple, black, or red color. The second type of lure we will call catching lures. You have found an area that has produced a few fish with your search baits, so now it is time to slow down and work the area over three or four times. Yes you might even fish it for a while and then leave it and come back later to find it loaded with fish that willing to bite. Once I find fish I start trying to fine tune my presentation and lure selection to catch more fish. I like to start by changing the size and weight of my bait. This could be going from a 5 inch swimbait to a 3 inch swimbait or vice versa. Hook size is very important this time of the year. I go from Bass Assassin JA series 4/0 hook to their 5/0 hook. I will usually go from a 1/4th to an 1/8th mostly, but sometimes will go to 1/16th. If you using a swimbait hook like the Owner Beast, I will go with an unweighted version and go up or down a hook size depending on bait size. When fishing with hardbaits fine tune them, by sound, size, and type of action. If you want to change the action go to single in line hooks made by VMC. Little small changes will make a major difference in the catch ratio with hard baits. When it comes to redfishing lures, it is a lot simpler. The forage of the redfish has changed from shrimp and pogies to mullet and crab primarily. 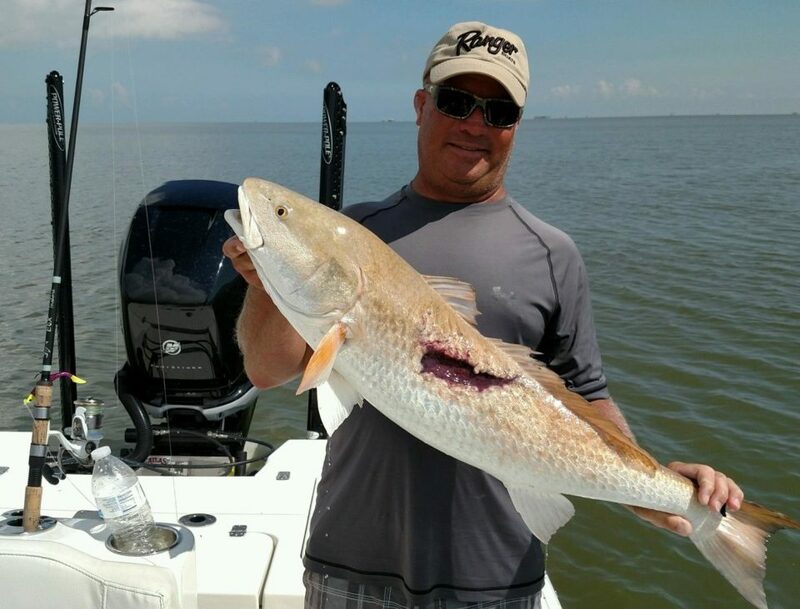 The reason is you are going to be doing one of two types of fishing for redfish from December to March. The first is sight fishing in clear water that is either real shallow or 2 to 4 ft of water that is clear sand or mud bottoms against Roseau Cane or a flat. The second option is fishing deep holes or rocks/rip rap areas. The first situation requires you to put down spinner baits, chatter baits, and spoons. The fish on the flats are going to be a little more lethargic versus summer and early fall months. Swimbaits rigged texas style or an Owner Beast Swim Bait Hook will produce a lot more strikes. The reason for the increased hook up ratio is lure presentation and amount of time lure stays in strike zone. I like to go down to either 2 or 3 inch Gulp Shrimp on a 3/0 or 4/0 Owner Beast Swim Bait Hook or a 1/8th Bass Assassin JA 5/0 hook. A swimbait like a Bass Assassin boss swimbait, a curly tail, or a lit’l taper are great finesse lures. When fishing deep flats, rip rap, or rocks I keep it real simple with three lures. A big swim bait like a Yum Money Minnow 5 inch on Owner Beast Swim Bait Hook weighted for rocks and unweighted for the flats. A crankbait either a square bill or a lip less crank bait. I like red, pink/gold, blue/silver, and bright fire tiger. The third is a krocodile spoon in one ounce. I take the treble off and replace with a VMC inline single hook. You will get a better hook up ratio, it’s better for the fish, and safer for you. 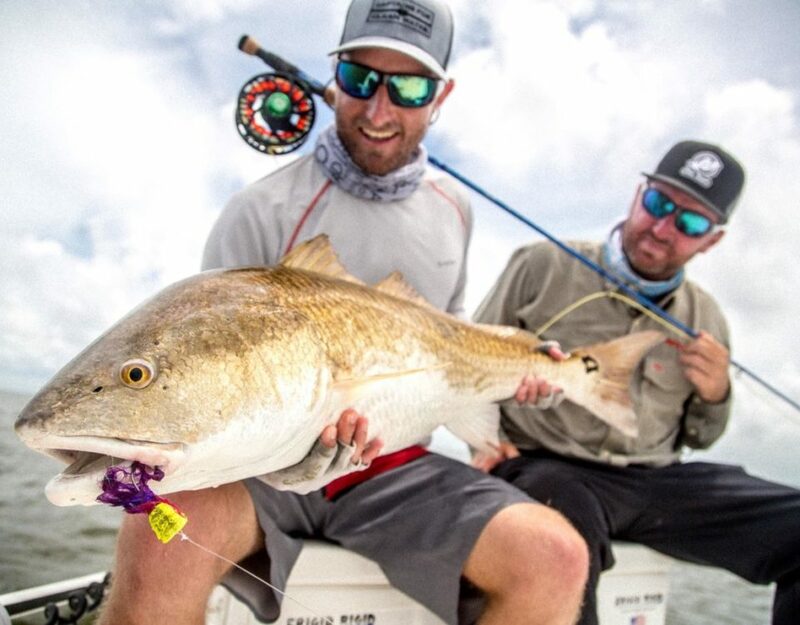 Fly fishing for redfish is on two ends of the spectrum. The first end would be slot fish and the second spectrum is bull redfish from 30 inches up to 50 inches long. Two totally different approaches when it comes to flies for these types of fish. The slot fish a more match the hatch type of presentation and smaller flies. Crab flies, spoon flies, little toads, crawlers, and shrimp patterns work best. A nice presentation that is slow and steady with small strips. Natural colors seem to work best on the smaller guys, at least for me. I prefer an 8wt or 9wt if windy for these slot fish. I like to downsize my line one size. Yes, I know this is again most of the recommendations, but it works great for me. I prefer a a 7.5 foot leader instead of 9. When it comes to the big bulls the bigger the fly, the more water the fly moves, the deeper the pop, and the more flash the fly has the better. I’m throwing flies on 2/0 and 3/0 hooks and 6/0 on my poppers. I use mostly 10wt rods like the GLoomis NRX and still go down a size in fly line. I prefer a Sage 6200 series reel. I prefer a 7.5 leader here as well. 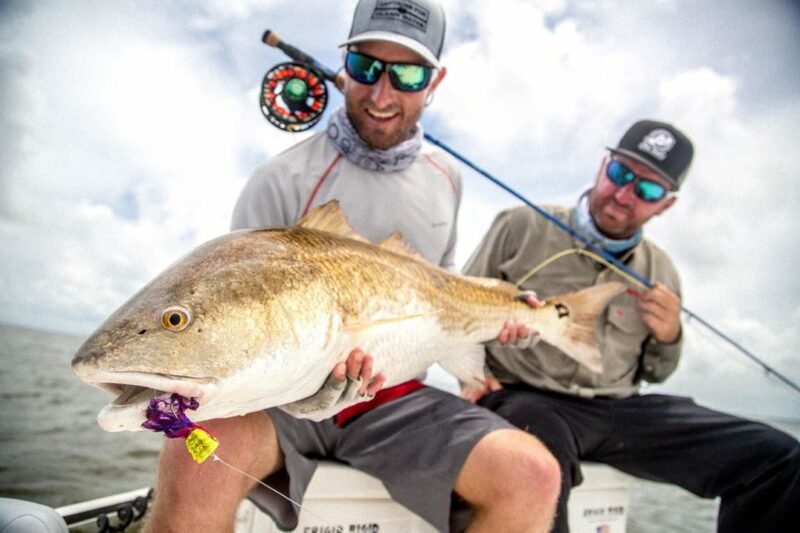 Check out www.steeliebrosflyco.com for my signature Gulf Coast Redfish Flies. When it comes to my light tackle I like a 7 foot rod like the GLoomis NRX 851 or 852. I go down to 20 pound Sufix Performance Braid with a 30lb Sufix Fluorocarbon Leader. I like an 8 to reel ratio like the Shimano Metanium. When it comes to spinning gear a Shimano E6x 904s and a Shimano Stradic 3000 is a great match with 20 lb Sufix Performance Braid. During winter months be patient, slow down, pick your days, you will find less crowds, and a possible fish of a lifetime. Always take a spare set of clothes in the boat, just in case you get wet. It can save your trip and possibly your life.